So, you know the drill by now; 30 September, the BBC released the Monster Collection, featuring six beloved adversaries who were lucky enough to appear in both the pre-1990 serials and the Shiny New Series. You can buy the complete forty-pound boxset or individual DVDs. It's presumably aimed at new fans, although the lack of any special features whatsoever means that they're not a great bargain; the Davros DVD, which has "Genesis of the Daleks", "The Stolen Earth" and "Journey's End" with no extras goes for seven pounds. If you bought these stories on the preexisting DVDs instead, even without looking at the value-added boxsets, it's only another two and a half quid to buy yourself the proper version of "Genesis" with all the extras and the vanilla DVD release of "The Stolen Earth" and "Journey's End" that includes "Turn Left" in the bargain. This looks like fodder for supermarket shelves, to be honest, although we have no idea why the boxset is sold out as of time of writing. "Genesis of the Daleks" is, as any fule kno, one of the best Dalek stories and even more easily Davros' single best story; blah blah blah, contractual obligation to note Michael Wisher's brilliant performance (yours truly has a soft spot for Terry Molloy's work, but when there's room for only one pre-1990 story, the choice is obvious). In other contexts, Davros has to be made to fit into the DW universe at large, as One of Those Monsters, which is accomplished to a greater or lesser degree of plausibility. In "Genesis", it's much simpler; this is Davros' world, he exists in an environment whose terms he controls, and the Doctor is hard-pressed to undermine it at all. This is so right from his first appearance, when he's testing the capabilities of the Daleks; the Doctor and Co. know that eventually the Daleks are going to be a force in their own right, but nobody on Skaro does, and for nearly the entire story they really do obey the wishes of the creator; heading off to exterminate the entire Thal city, trying to exterminate prisoners instinctively, that sort of thing. Every possible threat - the Thals, the Kaled civilians, his fellow scientists - are dealt with meticulously and frightfully, and it's only the slow coming to terms of the Daleks themselves that finally takes down Davros in the end. But only temporarily. 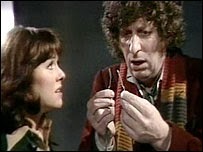 Of course, Sarah Jane is in both stories of this set, which helps with the continuity a bit. She has the first and most memorable cliffhanger in "Genesis of the Daleks", watching Davros conducting the first tests of the creation (it's surprising how naff most of the cliffhangers are, actually; a very good reason to watch it movie-style and not as a serial). Nevertheless, they don't actually meet until episode four; we have one long scene at that point, most of which involves the Doctor or Davros monologues...so they don't have nearly as much interaction as you might expect from Sarah's angry references to it in the sequel. It's much the same problem as Steven Moffat had with referencing the "etheric beam locator", such a memorable bit of technobabble that he used it for an oddly-shaped bit of Dalek technology in "Curse of Fatal Death"...except that the beam locator is the Doctor's, and he makes sure the Daleks don't get their protuberances on it. Of course, that wasn't canon, while "Journey's End" is. Bit awkward, all told. And then we get to "The Stolen Earth" and "Journey's End", and...well, thematically it ought to work for this set if only because it is a sequel, from Sarah Jane's point of view (and while she says she's learned how to fight since then, it's not as if she urged pacifism in the original. Quite the contrary.). But it still flags a bit from the monsters angle. Because the Welsh-era story isn't actually about the Monster in question, per say, and that makes a difference - Davros has three scenes in the whole first episode, and one of these is only three lines long. Of the many faults of something like, say, "The Sontaran Stratagem", there's no denying that the Sontarans are the point of the storyline there in a way Davros isn't here (the only similar problem in the Monster Collection is the Master set with "The End of Time", and even there John Simn has an episode all to himself, threat-wise). He's not even the focus of the cliffhanger. Davros gets more to do in the latter half, but that episode has so much in the way of tidying up to do - finish up Rose's storyline, including the parallel universe business, finish up Donna's storyline, give all of the other companions fitting send-offs, create and marry off an entirely new iteration of the Doctor...that the whole saving-the-universe from Davros business only has so much time that can be afforded to it. And the story has still got Daleks in it, who get to do lots of exciting shooty things as usual, almost turning the Doctor into Matt Smith and so forth, and so the perpetual problem of a Davros story about the balance between him and his creations doesn't necessarily work out in favour of the humanoid one. It's a story with Davros and not starring him, hence all the Doctor's chitchat about him being the "Dalek's pet". Julian Bleach turns in exactly the performance that the script asks of him, it's just not quite as rewarding a part as you'd expect. This isn't, quite, a problem from the story's point of view, which is clearly interested in doing other things, but it doesn't lend itself to marketing as a Davros character piece. Quibbles aside, it is true that when Davros is on screen, he gets quality material. The introduction is appropriately understated and suited to Bleach's silken delivery, and the memorable passage where he reveals how he's been creating this current batch of Daleks is all too vivid, but entirely in keeping with his characterisation. It's also interesting comparing Davros' character development here with his earlier stories; the current version of the character is noticeably more cynical about his creations' character flaws than he's even been before (even while trying to reprogram and fight off opposing selections, he never questioned their arrogance in quite the way as he chides the Supreme here). He's also much more interested and knowledgeable about how time works then before, certain in his belief that Dalek Caan is picking up on information that "saner" models have no access to. And that's important, because if it was his listening to Dalek Caan that explains why the Doctor and the TARDIS are left behind at the crucial moment at the start (and why, exactly, would the Supreme Dalek order that when the fleet of Time War Daleks think that they're more than capable of handling one single Time Lord? ), then it must be because he believed Dalek Caan's prophecies about how Time works out. Which, given that Caan is insisting an army of companions have to be brought together before the destruction of the universe can proceed as planned, would tend to suggest that his loyalties may not be as clear cut as everyone in the episode thinks, or even that he's more a Cassandra-figure than a prophet of good tidings...but Davros doesn't realise that until the end, does he? Curious how much he trusts one mad Dalek, but then you'd probably listen to someone who broke you out of a Time War...(we could speculate as to why Caan's loyalties have changed through exposure to the Time Vortex, but that's another issue and outside our scope here). But then, from Davros' point of view he seems not to care all that much even when Caan is revealed; for all that the entire point of this season-spanning planet engine creation is, he seems perfectly content at the end to die in flames as long as he's proven his point to the Doctor about being the Destroyer of Worlds. Which is interestingly on targer as a bit of emotional manipulation, and powerfully poignant for this post-Time War Doctor, but oddly flat from someone who's been quite keen on destroying any number of worlds himself. Moffat's shown no sign of interest in reviving the character since, and from this ending he's right to do so. In his first story, Davros wanted to destroy the universe with the Daleks and saw the Doctor as a mere nuisance; in his last, the Daleks and the universe can go hang as long as he's emotionally destroyed the Doctor. Which he has to a great extent, if the traumatized figure in "The Waters of Mars" onwards is anything to go by. Where would you take the storytelling at that point? So: both stories are worth the watching if only because of their lynchpin status to so much of what happens around them, both feature excellent actors playing Davros, and both are effectively horrifying (the body horror of Davros' flesh in "The Stolen Earth" matches any shot of unsavoury tentacles in "Genesis"). Would we recommend you watch them on this DVD set? Perhaps not. Terry Molloy is good (and turns in a great performance in the audios), but he always overacted it a bit for me. He moves more as a head in Remembrance than Wisher did with his whole body in Genesis. Even Bleach, who gave a subtle performance in part one, moved wildly and erratically in Journey's End. Davros is subtle, quiet, calculating. Quietly, surprisingly insane. Terry Malloy has BECOME Davros in the audios...he's really grown into the role. Much less so in the TV series I think. BF's "Davros" is just so darn good...Malloy puts Colin almost in the background. That said, Bleach did a good job with the very little he was given. I won't hide my utter hatred for StolenEarth/Journey (easily RTD at his worst), but for the few moments Bleach was given to be Davros, he nailed it.